fantasy art and tree chatter of aquariann: Branch out to Purple Peacock Jewels! Branch out to Purple Peacock Jewels! Women don't need glittering jewels to let their inner goddesses shine outward - but it helps. Especially if they're wearing an amazing accessory by Natascha of Purple Peacock Jewels. Her fancy bindi to the right is even named after Sarasvati, the Indian goddess of wisdom and erudition. Bindis are traditionally placed in a spot on the forehead that corresponds to the Sixth Chakra or Third Eye. Some believe that bindis strengthen intelligence and concentration - while others just wear them as a fashion statement. Beautiful bindis are a unique way to add glam to a wedding dress, belly dance costume or date night outfit. After my eyes danced longingly through Natascha's Etsy shop, it was hard to believe that she only recently discovered her love for making jewelry. She didn't even like crafts as a kid or teen! 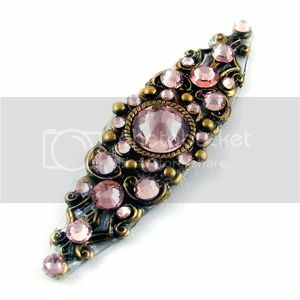 Now she happily handcrafts designs using aged-metal components and sparkly rhinestones galore.